When it comes to our diet there are many foods out there to choose from, however some are going to be better options than others depending on what we are looking for. Some foods are just more nutritionally dense than others, and thus are better food choices for us. Here are some suggestions as far as what you should be eating depending on the meal. As we have all heard the saying before, breakfast is the most important meal of the day and for good reason. After an entire night of sleeping where your body is deprived of the nutrients it desperately needs, your body needs these essential ingredients and is craving for them. Make sure you are eating a full balanced meal to get a jumpstart to your day. Oatmeal is a powerful whole grain that contains the necessary ingredients to make the glucose which our brain runs on. Oatmeal is a good base to work with, and becomes a power food when combines with healthy fats from flax seeds for example, along with powerful brain boosting antioxidants found in berries. Add in a banana for some extra calories, fiber and heart healthy potassium as well. When it comes to nutritional value and ease of preparation, nothing can really beat a good yogurt smoothie. Non-fat Greek Yogurt is one of the best sources of lean protein out there, clocking in at 22 grams of protein per serving. 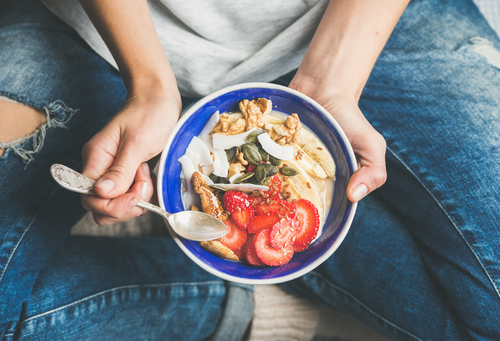 Yogurt is best paired with a healthy fat from peanut butter for example, along with berries for their fiber and antioxidants, along with a banana for fiber and calories as well. Eggs are one of the best all around foods as they are packed with protein, vitamins and minerals which all help to improve how your brain functions. Eggs are another food that is really easy to prepare, and that goes along with pretty much any vegetable you want to throw in with it to make a well balanced meal. Add a piece of toast to completely round out the meal. When thinking about lunch, it is usually something that is rushed and is done out of convenience. Because of this, many people turn to fast food and other heavily processed foods because they are readily available and require no preparation. These foods are usually packed with artificial ingredients, salts, sugars and fats which will be detrimental to how fast our brains are able to process information. To put it easily, fast food items and processed foods are ones we want to stay away from because they will not only not be beneficial but could actually do us harm. Try to choose an alternative that has less calories and is lighter on the sugars, salts and fats as well. Salads should be your go to food choice when it comes to lunch for a variety of reasons. First of all you can add numerous items to your salad which can help to mix things up a bit in the interest of not being bored with what you are eating. In addition to this, adding things to your salad like nuts, seeds and proteins will improve the nutritional profile of the salad as well, or make it even more healthy for you. 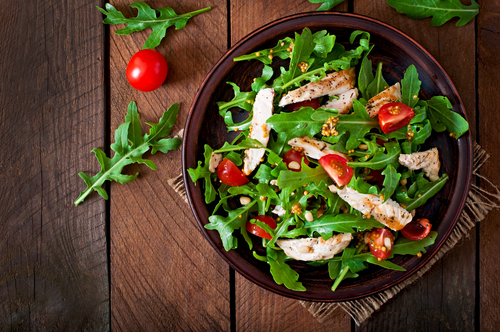 If you are uncertain of how to build a nutritionally balanced meal consisting of salad, try to incorporate greens, good fats from nuts or seeds, protein from chickpeas, chicken or turkey, and antioxidants from dried cranberries or raisins for example. Salads offer much more versatility than other foods out there, which in turn makes it more difficult to get tired of. When searching for healthy dinner choices the best place to start is with a whole grain, a lean protein and plenty of vegetables. Whole grains will supply your body steadily over a long period of time with the energy it needs. Eating whole grains is what keeps you satiated until breakfast the next morning. 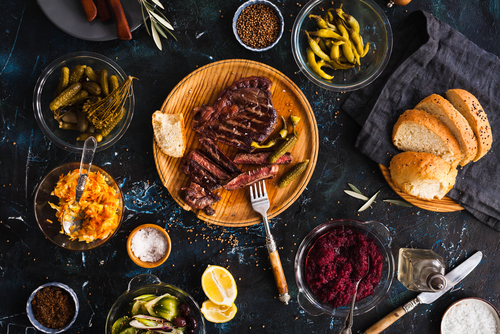 Make sure that your meal consists mainly of lean proteins and plenty of fiber, as there are the two things that are going to keep you full until the following morning.